Two men in their 20s have appeared in court after a shooting in County Londonderry. 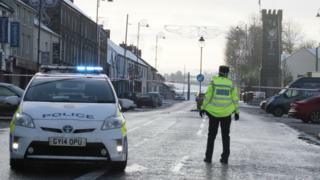 A 46-year-old man was injured in the gun attack during which three shots were fired in the centre of Garvagh. Christopher Torrens Crawford, 26, of Brone Park, Garvagh, and Philip Hara, 28, from Agivey Court, Garvagh, appeared at Coleraine Magistrates' Court. Mr Crawford is charged with attempted murder and possession of a shotgun. The quarry worker is also accused of possession of ammunition with intent, carrying a firearm in a public place and discharging a firearm in a public place. Mr Hara, who works as an asphalter, is charged with assisting an offender. He allegedly washed clothes and trainers belonging to Mr Crawford after the shooting and provided him with a change of clothes. A defence lawyer said Mr Crawford had made "several admissions" to police during interview, but disputed what his intentions had been. His case was that he took the shotgun out to "scare" the victim, not to kill him. The court also heard that, during a police interview, Mr Hara had denied turning on the washing machine to wash Mr Crawford's clothes. Police objected to bail for both men. A PSNI detective told the court the victim believed both men were linked to the Ulster Defence Association (UDA) in Garvagh and "run the town". A defence lawyer said Mr Crawford denied links to the UDA. Police said the shooting was "a vicious and dangerous action carried out by a man under the influence of alcohol". The victim needed surgery for his bullet wound, and was treated for other injuries to his face and body. The court was told there was no sectarian element in this case. It heard the victim had been drinking in Garvagh's Central Bar when Mr Crawford and Mr Hara, who are both known to him, entered at about 02:00 GMT on Sunday 10 December. The court was told a fight broke out between Mr Hara and the victim's son. Afterwards, the court heard, Mr Crawford went to a house, got a shotgun, went back to Main Street and shot the victim in the lower leg. It was heard the incident was caught on CCTV, including an audio recording, and that a witness allegedly heard Mr Crawford say to the victim: "I'm going to do you." A district judge refused bail for both Mr Crawford and Mr Hara. They will appear in court again via video link in January.